Peel the clementines, or oranges. To do this, cut away the pith and peel with a sharp knife then, holding each fruit over a bowl to catch the juice, cut away each segment, leaving behind the fibrous casing. Repeat the process with the ugli fruit or grapefruit. (If you find it easier, you could simply slice the peeled fruit horizontally into discs.) Drop the citrus slices into the bowl with their juice and stir in the Cointreau. Peel the mango with a sharp knife. Cut the flesh away from the hard stone in four pieces. 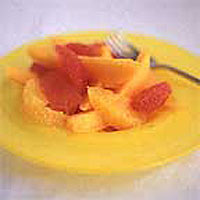 Cut each piece of mango flesh into elegant slices and add to the oranges or clementines and ugli fruit or grapefruit. Serve.